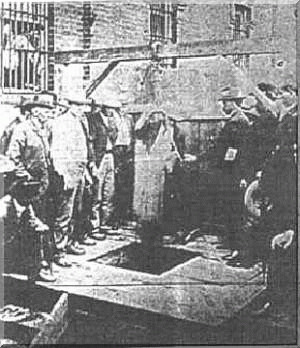 On this date in 1904, a 61-year-old veteran of the U.S. Civil War was hanged for murder at Paragould, Ark. Mart Vowell, the hanged man, was anomalously the former city marshall of Rector, Arkansas — and his victim the town troublemaker, whom Vowell had previously arrested. Even the grand jury summoned to indict the killer had to be dismissed after repeatedly returning only second-degree charges. This case cries out for primary research beyond the scope of this blog’s daily deadlines further to the motivations of the characters involved, but the bottom line is that Vowell hanged before a highly sympathetic crowd — calling “Good-bye, Mart!” as he “died game” — in Paragould, Ark. * Given the famous characters evoked by name, we need to note that our day’s principal, Mart, was actually named Martin Van Buren Powell, which would presumably make him a namesake of abolitionist former U.S. President Martin Van Buren. Just saw this site. I am Georgia Ann Jones Keller Vowell’s great granddaughter. Ab was my great uncle. Rector Library has book, “Showdown at Blue Cane” about Blll Lovejoy and Mart Vowell written by Bill Lovejoy’s great great grandson, David Galster. Mr Galster’s book is good. E/book available from Smashwords. The Rector Library also has a laminated copy of the Paragould Soliphone newspaper containing the day of hanging. I have hand copied as mich as possible. I am looking for a copy in better condition so I can fill in some blanks. Bill Lovejoy was the man Martin Vowell shot, he was my grandmothers sister’s , husband. My grandmother was Grace Mae Lovejoy. This Mart guy is my great x3 grandpa. I got papers proving. Thats pretty cool history stuff right there. Hi Dale,Mart is also my ggg grandpa on my dad’s side Lindell Vowell is my dad if you have a fb I’m trying to add all the family on there to keep in contact it would be nice to hear from you. For some reason I have photos of this day among my oldest family photos…not really sure why unless they were a part of the group hoping for a stay??? I may be mastakin on Marts middle name . Was Van Buren his middle name? Hi Stephen,Yes it was Martin (Van Buren) Vowell. O my goodness I found a relative I didn’t really know who all I am related to I am Abner’s great-granddaughter which Lanny Vowell is my dad.How are we related on my dad’s side?Yes I believe if they had a different judge he probably would have lived longer because there was something going on with that. I agree with Kathryn. The whole trail sounds like it was a sham and someone had it out for Mart Vowell, Who by the way is my great great great Grandfather. Lovejoy sounded like a troublemaker who got what he deserved. He was known to have killed almost a dozen men. Had several run ins with Marrt Vowell when he was a Constable. Greetings, Mart Vowell is part of my family tree. My grandma’s maiden name was Vowell – Maudie Ilyer Vowell, one of 3 sisters. If you see this, give us a ring. We’re working on the family tree. We have a very tattered 1909 newspaper on this event and we believe Uncle Mart was railroaded. Hi,Barbara I am Mart Vowell’s 3rd great granddaughter on my fathers side-Abner Red Bismark Vowell was Marts son and he was my great grandpa.I have a relative Brenda Gartside Simmons who has a lot of the Vowell family tree she is on Facebook if you do not already know her she is a distant relative who is also a relative of the Dukes who is also our cousins. Kathryn, Ab Vowell was my great uncle. I noticed you were related to the Dukes also. I am interested in that connection also. My grandmother’s neice, Ora, was married to George Duke. Yep, Bill Lovejoy was something else! I don’t think Mart Vowell should have been hanged for shooting Bill. For 1904, 61 was old. The life expectancy in the US in 1904 was 47. Good riddance. And I say that as an opponent of capital punishment. Well, I believe some of the good ol’ boys of the town should have freed ol’ Mart, and skedaddled with him in the dark of the night. (notice my poor attempt at using outdated language from “bygone” days, LOL! ).